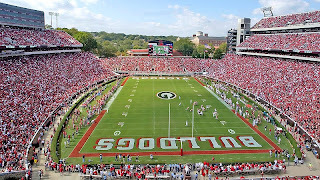 Earlier this week, UGA announced its plans to "improve the tailgate experience" via its new site GamedayGameplan.com. During its initial launch, the site did a solid job of communicating and explaining the reasons for the changes. However, the missing piece of the puzzle was the map that shows the Family Friendly Tailgate Zones. That's where the proverbial rubber meets the road, and we see how much UGA grossly overreached in its zeal to bring back the Temperance Movement. UGA published the map today, and the Family Zones are positively massive. Approximately 40% of North Campus is now reserved for non-drinking tailgates, and the ENTIRE Brooks Mall is reserved as well. Click to Launch the map in a larger window. 1. Are there really so many tailgates that involve ZERO booze that you need such a large chunk of prime tailgating spots? To tailgate in these areas, you have to be a teetotaler on gameday. No booze permitted whatsoever. How many folks tailgate 100% booze free for ALL members of the group? Note: I didn't ask how many ATTEND the game 100% booze free, but how many tailgate that way. 2. Will the non-drinker only tailgates move to the reserved prime spots? Well, obviously not if they had a decent spot to begin with. It's not like the Trail of Tears where all the non-drinkers are going to be herded up and forced to the family zones to free up spots for the displaced drinkers. 3. What happens to mixed groups? We have a large group, but 30% don't drink anything and another 40% don't have more than 1 or 2. Of the rest, we're talking 2-3 folks that get a really solid buzz going. But no one has gotten out of hand. Ever. Are the 10-15 people in our group that don't drink anything going to move to the new zone? No. Why? Because, it's the drinkers that plan, cook and organize the thing for everyone. 4. With all the breeders in our group, we probably have 5-7 kids under the age of 6 that tailgate with us. We are family friendly. And we drink. And we bag our trash. Yet, we can't tailgate over there. If any of our guests were uncomfortable with our drinking, they could start their own tailgates. And they haven't. 5. The presence required to keep people from drinking in the Family Zones means more cops won't be in the Drinker Zones. Given the upheaval in people moving around, there's going to be more conflict in the drinker zones than the non-drinker zones. 6. The shotgun start at 7:00 am creates an even greater sense of urgency and forces people to get there earlier to stake out a place. Thus, creating more conflict. Why do I care about this? Because I tailgate near one of these two areas, and all of the displaced tailgaters from those massive areas are going to need a place to land. As RoyOrbisonDawg (a non-drinker) said, "What's the point of putting grass on Brooks Mall if no one is going to tailgate over there?" How frustrating. Basically, it looks like the people who tailgate on North Campus are being "punished" for the mess they made at Auburn last year. Which at some level, I can appreciate. However, instead of punishing EVERYONE, wouldn't it have made more sense to just fine the litter bugs, place more trashcans out and haul off the abusive drunks? Why create new laws to pester everyone, when enforcing the old laws would've worked so much better? Or why not experiment with modest sized family zones before we move to lock down such large swaths of ultra prime real estate. When the city of Mobile put in a "family friendly" zone for Mardi Gras, a thousands of people flocked there. Don't get me wrong, if you wanted to find a party it wasn't that hard. But it was nice they gave folks the option. What amuses me on the sick, cynical level in which I reside, is, what happens when the family-friendly people leave their bastion of teetotaledness, and have to crawl through the dark underbelly of booze town to get to Sanford? Will they demand that the 'Family-Friendly' zones be placed in a quarter-mile quarantine zone around the stadium? While it is clear that some crowd control is desirable, and while you would want to do something to preserve the integrity of the lovely north campus, good leaders know that the smart thing to do when enacting laws, regulations, rules, etc. is to make them reasonable enough to be enforceable. In the end, prohibition couldn't work; ultimately, the problems already pointed out will create a "cluster" of problems. I am pretty sure Public Safety goons will make a serious effort to enforce it - and really good, decent folks will be hurt, embarassed, etc. - but eventually I think that if MA has an out that will allow him to save face, it will get changed enough to be livable. North campus by the Arch is a favorite of the poeple who have to park in the decks and don't have large tailgates. I live out of state and have many friends who do the same. When we travel to games it's a lot easier to meet up in North Campus and tailgate rather than try to coordinate 4-5 cars arriving at different times in the same parking area. Of course I'd like to have cold beverage in hand while waiting on my friends. Basically this is just a ploy to get more people interested in paying for tailgating spots thus driving up prices and creating more revenue for UGA. I have the utmost confidence in this plan. After all Mickey Adams is responsible for it. What we all have to bear in mind is we are too stupid to understand what this great man is trying to accomplish. In fact if he tried to explain it to us our heads would explode. The entire situation reeks of bureaucracy forcing its hand into an element where self-policing had done a pretty good job so far. I doubt they'd be trying anything like this if they hadn't received a lot of complaints. It looks like they're getting pretty greedy on just how much space they're reserving, though. I'd bet a third or a quarter of what's being reserved would be plenty for any ENTIRELY non-drinker tailgates. Any of you guys know if the campus parking decks will open at or before 7AM? PWD, you make some great rational points on your way to creating a solid argument. This may be the single greatest post you've made to date. I really wish there was a way to send this to all the people in the athletic and academic departments at the school. This isn't the athletic department's idea in any way shape or form. Don't pin this on Damon and the gang. This is Adams.